LogServer captures uncompressed IP sources including metadata, enabling broadcasters to be fully compliant during their IP deployment. 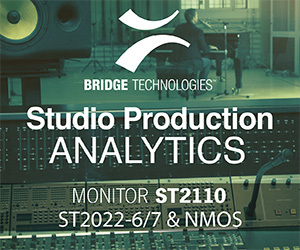 New solutions offer unified recording, monitoring, and analysis of live TSoIP, SDI, Media over IP and OTT sources. Melbourne-based, T&M innovator Mediaproxy will show its new source comparison feature for real-time identification of mismatched content at the NABNY. The new feature compares video content from one or more live sources and provides real-time alerts when there is not a match, ideal for network operators managing multiple stations and playout facilities. Mediaproxy will also demonstrate LogServer with its new integrated AI engine that works to detect advertisers’ logos, parental guidance and viewer warnings, providing operators with multiple monitoring and competitive analysis options. LogServer supports Newtek NDI and both SMPTE 2022-6 and SMPTE 2110 media over IP formats, enhancing the input matrix into its compliance recording and monitoring solutions. Mediaproxy’s Monwall interactive multiviewer software will also be on display with new and fully customizable penalty boxes. The boxes offer operators the ability to monitor events by exception through configurable threshold for various video, audio and metadata events.